When Percy Jackson received an urgent distress call from his friend Grover, he immediately prepares for battle. He knows he’ll need his powerful demigod allies, Annabeth and Thalia, at his side; his trusty bronze sword, Riptide; and … a ride from his mom. Riordan’s writing style, is fast and easy to read. You can’t just skip a sentence or two though, because so much happens in such a short time, that skipping a paragraph can have you completely confused. All the dam jokes! If you’ve read it, you’ll know. If not, this might be the best reason to read it. The book is so funny. It had me cracking up, at least once every chapter, if not more. What made it even better this time around, was that I listened to the audiobook. I love the narrator! He does all the different voices so amazingly, which makes it even better! Story-line wise, this book wasn’t my favorite from the series. 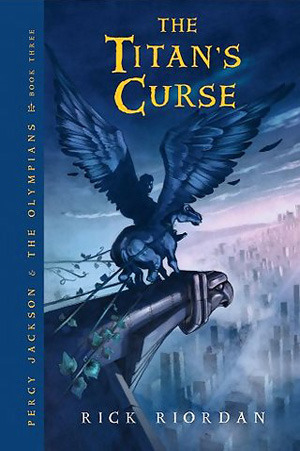 It actually may be my least favorite from the Percy Jackson and the Olympians series. I’m not quite sure exactly why, but there’s at least one character that doesn’t appear nearly as often in this book as they should, which was disappointing to me. There are also a couple of new characters (Nico and Bianca), which I thought was pretty neat. What I also liked, just like in the other books I should mention, were the prophecies. You never knew who they’re about until it happens. I think that particular part was done quite well. You’ll have to remember that the book is supposed to be a middle-grade book, therefore, certain aspects of the book might not have been as spectacular as they could’ve been in a young-adult, or adult novel. Thus, if you do not like the (let’s call it simpleness) simpleness of middle-grade book, perhaps this is not the book for you. I for one, love reading something simple and not too complex, especially when it’s hilarious and adventurous. I love these books! They’re so fast to read and funny, and entertaining! I couldn’t pick a favorite in the series.